Part of the prestigious Island Dunes Community, the Admiral offers pools, tennis, golf, marina, clubhouse, restaurant, secured lobby and underground parking. A SMALL INTRACOASTAL COMPLEX OFFERING DOCKS, DEEDED OCEAN ACCESS, HEATED POOL AND CLUBHOUSE. A BOATER'S FAVORITE! OCEANFRONT COMMUNITY OFFERING TENNIS, HEATED POOL AND MORE. THIS OCEANFRONT CONDOMINIUM OFFERS SECURED LOBBY, TENNIS, OCEAN, HEATED POOL AND ON-SITE MANAGER. 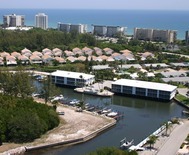 MIDRISE CONDOMINIUMS DISTINCTIVELY SITUATED ON THE WIDE RIVER IN INDIAN RIVER PLANTATION RESORT. SPCTACULAR VIEWS ARE ABUNDANT HERE PLUS ALL THE RESORT AMENITIES. CHARMING DUPLEXES LOCATED ACROSS THE STREET FROM THE BEACH WITH DEEDED OCEAN ACCESS. NORTH HUTCHINSON ISLAND RIVER TO OCEAN COMMUNITY OFFERING HEATED POOL, PUTTING GREEN, TENNIS AND LOBBY.